This awesome and fun-loving couple came in from Texas to get married in New Orleans, and their wedding was a total blast! Republic NOLA, a music club in the Warehouse District near downtown, was a unique place to photograph a wedding reception at... lots of character, and I loved the balcony above the dance floor, as this was a perfect place to position a couple of remote flashes to light the area. 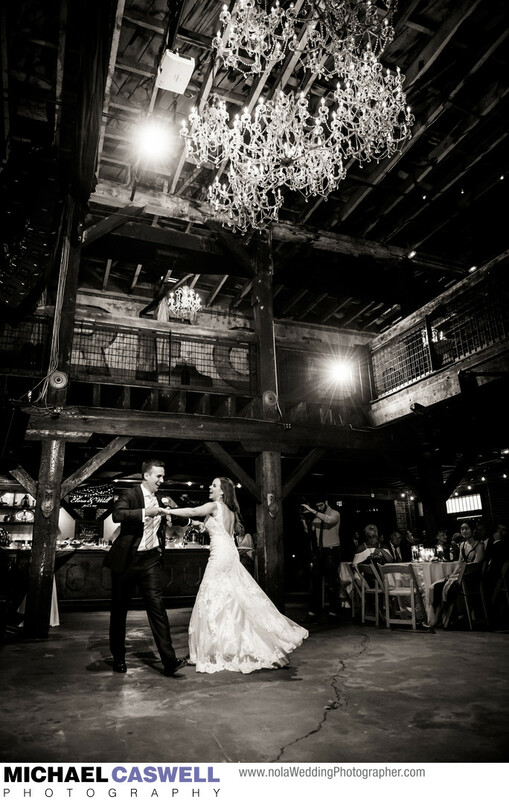 I deliberately made sure to get some very wide angle vertical shots that included the chandelier high above the dance floor, as this was an architectural element of the venue that the bride had previously told me she liked. This is the perfect venue for a couple who wants something a little gritty. The couple's wedding ceremony had taken place at St. Mark's United Methodist Church of the Vieux Carre on Rampart Street. A second line parade was planned for after the ceremony, but as anyone familiar with the downtown New Orleans area can attest to, marching from St. Mark's in the French Quarter all the way to Republic NOLA in the Warehouse District would be an awfully long walk! The perfect solution the bride and groom came up with was for the parade to march down Rampart Street, led by the fantastic Kinfolk Brass Band, ending up in front of Armstrong Park, where several buses waited to transport everyone to the reception venue. At the conclusion of the second line, the band accompanied the bridal party on a trolley bus to Republic, and performed there throughout the cocktail hour before the DJ took over the entertainment duties for the remainder of the reception, with the night being capped off by a sparkler send-off outside on the sidewalk. Location: 828 S Peters St, New Orleans, LA 70130.